Sports Rendezvous: SA Rugby boss calls for sports journo Joffe’s arrest. SA Rugby boss calls for sports journo Joffe’s arrest. Cape Town - SA Rugby president Mark Alexander wants to see sports journalist Graeme Joffe arrested once he sets foot in South Africa. Alexander has laid a criminal defamation charge with the police against Joffe following the latter's allegations that the SA Rugby boss was involved in corruption. In an interview with Afrikaans newspaper Rapport,Alexander said he wanted to stop Joffe from continuing with his “illegal and unlawful” conduct. 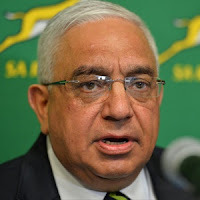 This comes after a report Joffe wrote on the BizNews website in which he accused Alexander of illegally obtaining money in 2010 when he, then as SA Rugby vice-president, made sure that Megapro landed a contract as commercial agent of SA Rugby.